This is a pretty rich dessert recipe, but it’s worth every calorie. Since most people are probably following through with New Year’s resolutions right now, you may want to file it away for a special occasion. I would have never guessed that pumpkin and Kahlua go well together, but luckily they do. You can pretty much use a liquor of your choice for this. I think Bailey’s would make a nice alternative, or maybe even whiskey. Grease a 9×13 baking dish with butter. 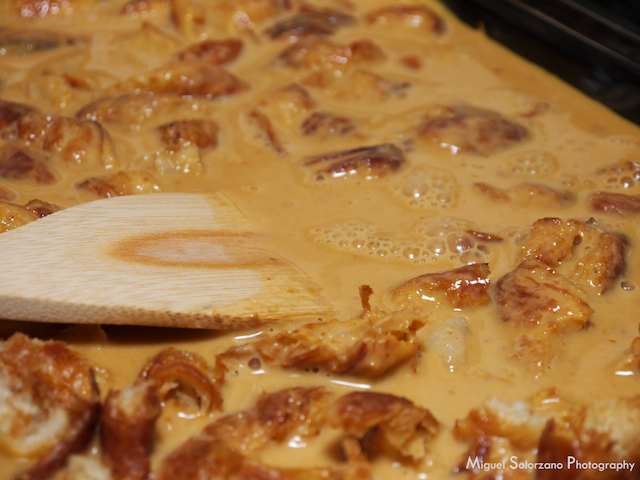 In a large bowl, whisk the pumpkin pie filling, heavy cream, eggs, milk, sugar, salt and Kahlua. 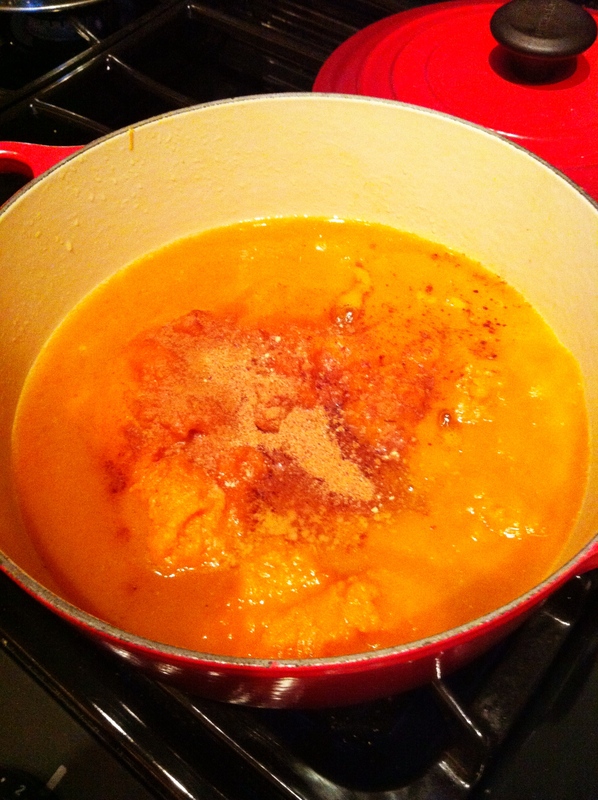 In the greased baking dish, place in the croissants then pour in the pumpkin mixture. 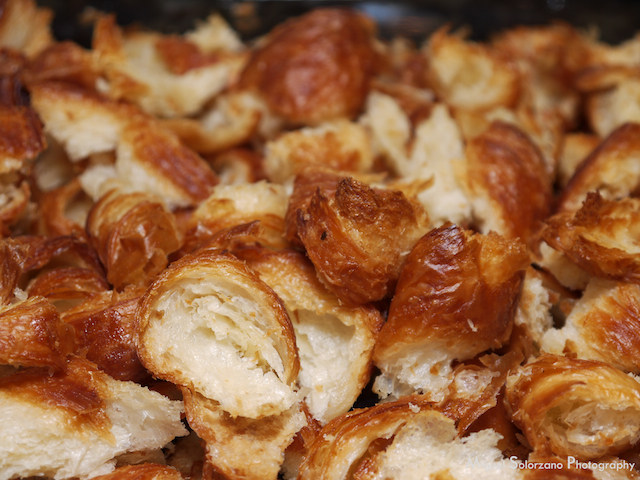 Press with the back of a spoon until the croissants are moistened. 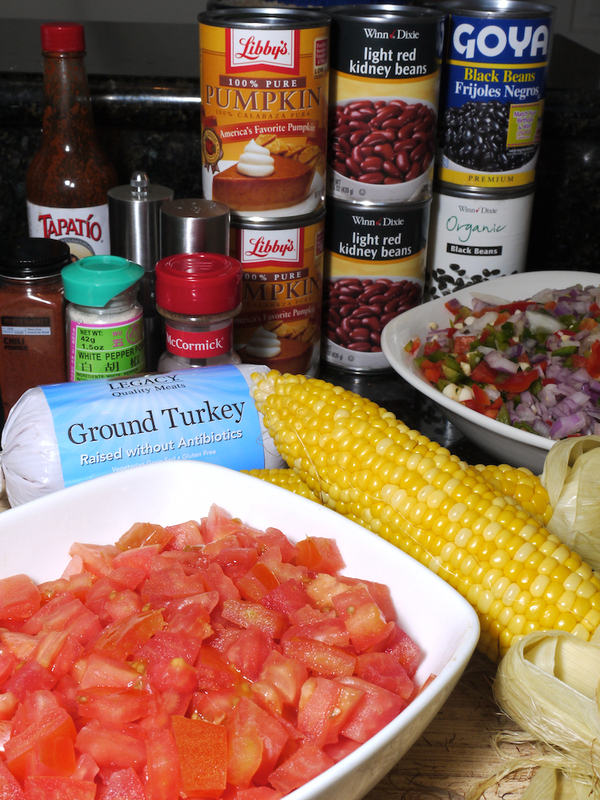 Bake for 40 minutes or until the center is set. One of the keys is to let the croissants dry out over night. They will maintain their butteriness, but will absorb more liquid if you do so. 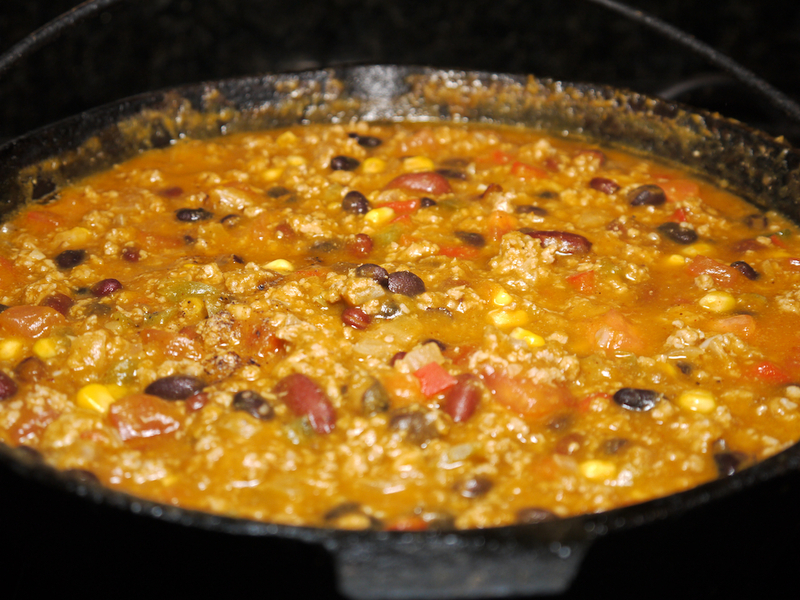 This is a simple recipe that will disappear very quickly. It’s also kid-friendly (despite the Kahlua) since the alcohol cooks out while it’s baking. 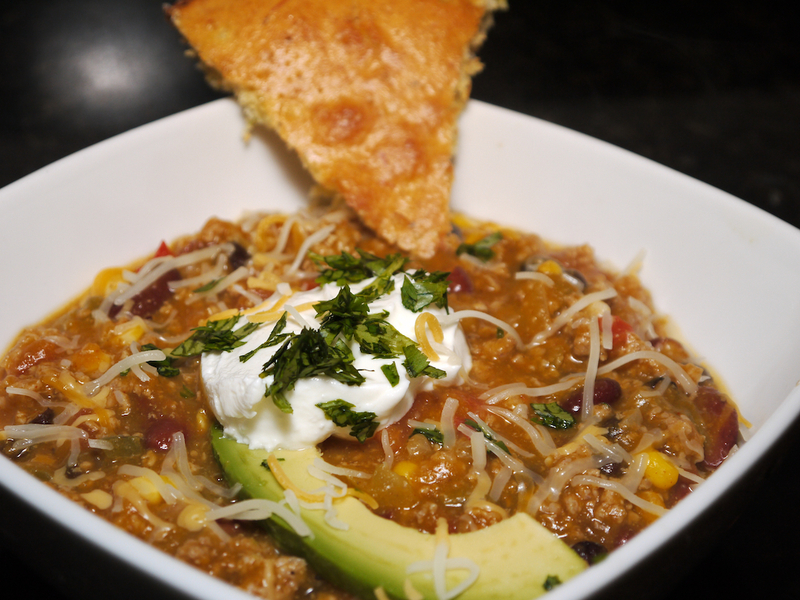 Of course, you can drizzle with some extra Kahlua to give it an adult kick. 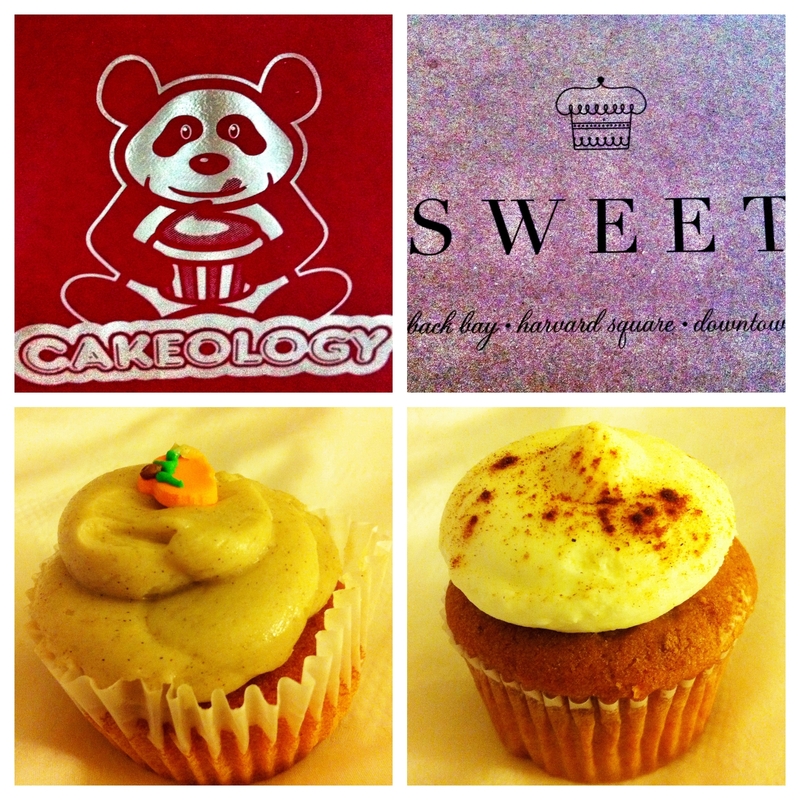 I’m a fiend for cupcakes so while in Boston I sought out two of the best shops: Cakeology and Sweet. Both are in the same vicinity in downtown. Cakeology operates in a single location on Province Street while Sweet has four locations throughout Boston. During my visit, I went to Sweet’s Downtown location on School Street. Cakeology’s shop has a nice interior seating area and it’s fun to watch the bakers out in the open. Sweet’s location is more boutique and feels like a more refined experience. But I’m not reviewing the interiors, let’s get down to the cupcakes! 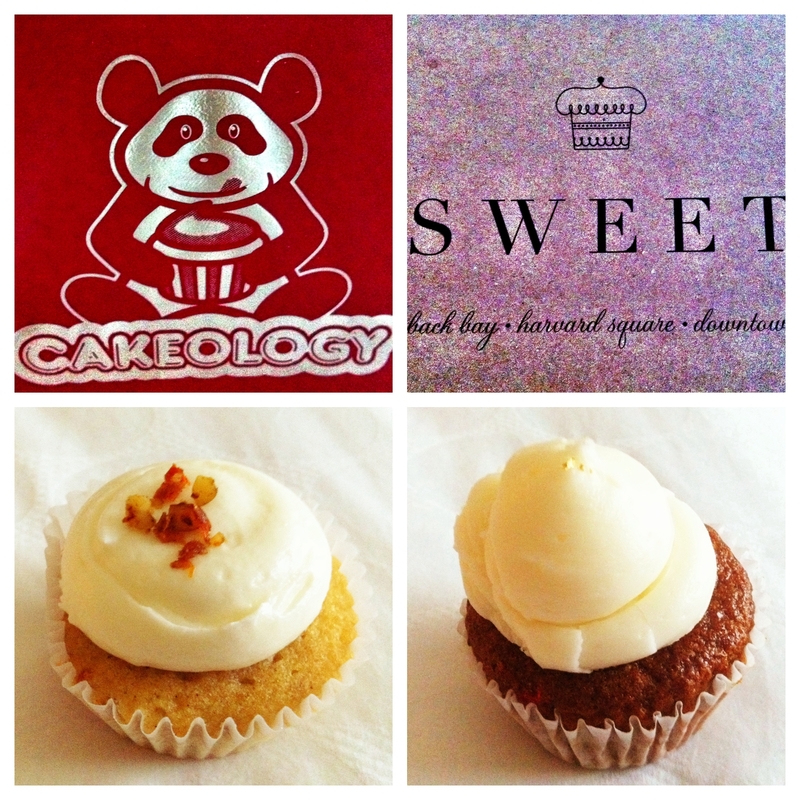 Cakeology’s Carrot Cupcake was moist, but a little loose and I didn’t taste many carrot cake elements that I’m used to. 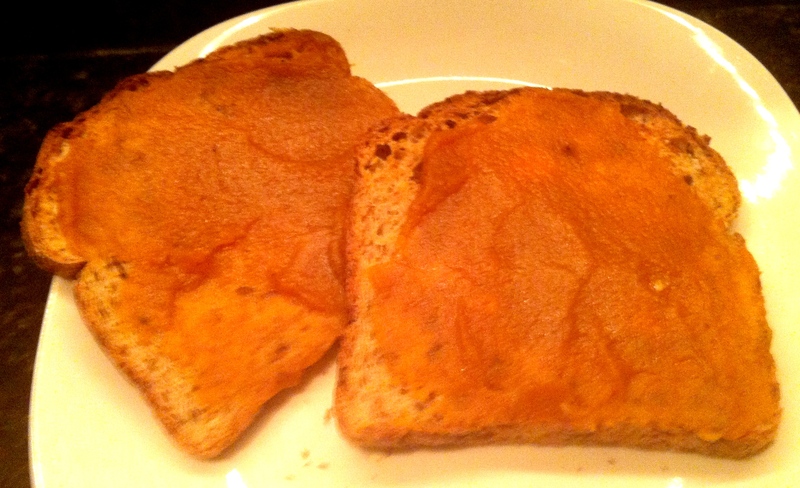 I was hoping for more texture inside with shredded carrot, coconut or walnuts, but it wasn’t there. The frosting, however, was great. 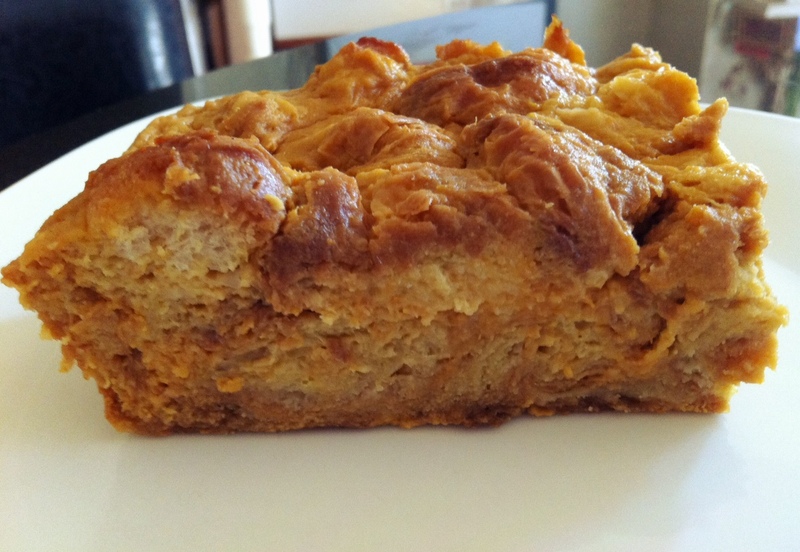 It was very light and fluffy and had the perfect cream cheese finish. Sweet’s Organic Karat Cupcake was a little on the dense side, but it was packed with more carrot cake elements. The diced pineapple really sent it over the top. However, I found Sweet’s frosting on this cupcake a little grittier than I would have liked. Overall, I have to give this one to Sweet. The carrot cake elements were there and the pineapple was a pleasant surprise and gave the cupcake more texture. That said, if I could put Cakeology’s frosting on the Sweet cupcake, I would have had close to the perfect carrot cake cupcake. First up, Cakeology. I didn’t get a lot of pumpkin from this cupcake. I know pumpkin is a subtle flavor, but this cupcake was lacking for me. The frosting was also a little loose. I did like the decorative pumpkin candy on top to give it a pop of color. But, I wouldn’t recommend this cupcake. Unfortunately, Sweet’s Pumpkin Pie Cupcake wasn’t any better. 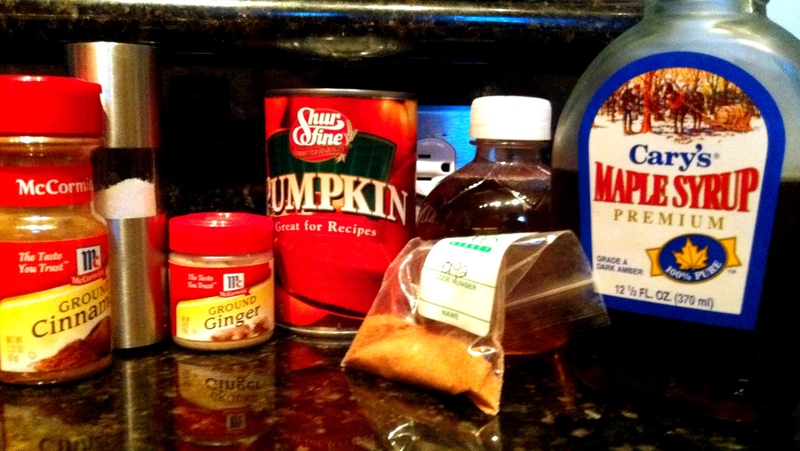 Once again, I didn’t get much pumpkin, but I did pick up on the nutmeg and cinnamon aspects. 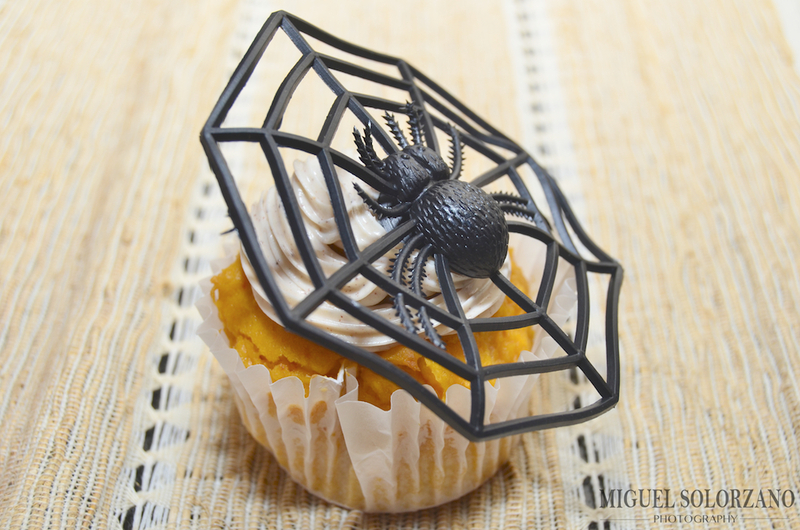 The frosting was creamy and tasty, but it really overpowered the cupcake itself especially the subtlety of the pumpkin. I wish I could, but I can’t recommend either of these cupcakes which is a disappointment because it’s Fall and everyone could use more pumpkin in their life. There’s definitely room for improvement for both shops on their pumpkin offerings. Red Velvet — the golden standard of cupcakes. I’ve always been baffled by how the red coloring seems to add unexpected flavor to a light cocoa cupcake. It’s got to be purely psychological. Cakeology’s Red Velvet Cupcake was delicious. The cupcake itself was moist with a definite hint of cocoa. The frosting was creamy with just enough cream cheese flavor. 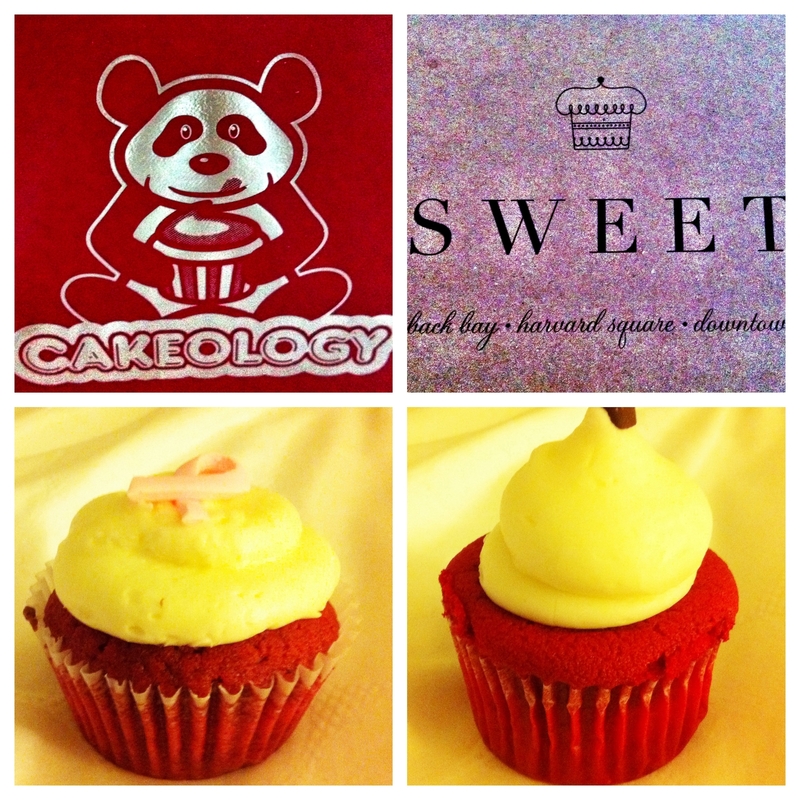 Put those two together and you’ll see that Cakeology has a damn good red velvet cupcake. Sweet’s Red Velvet Cupcake was a letdown. The cake was too dry (I tasted all of these cupcakes the day I bought them) and stuck to the roof of my mouth. Tastewise, it didn’t have the hint of cocoa I was hoping for. Aside from the cupcake, the frosting was gritty (much like the carrot cupcake) and there was too much of it in relation to the cupcake. I like frosting, but it needs to be used in proportion to the cupcake. Otherwise, the frosting can overpower the cupcake — that’s what happened here. Cakeology’s Red Velvet Cupcake wins this particular battle by a wide margin. Overall, these are two delicious cupcake places in Boston. 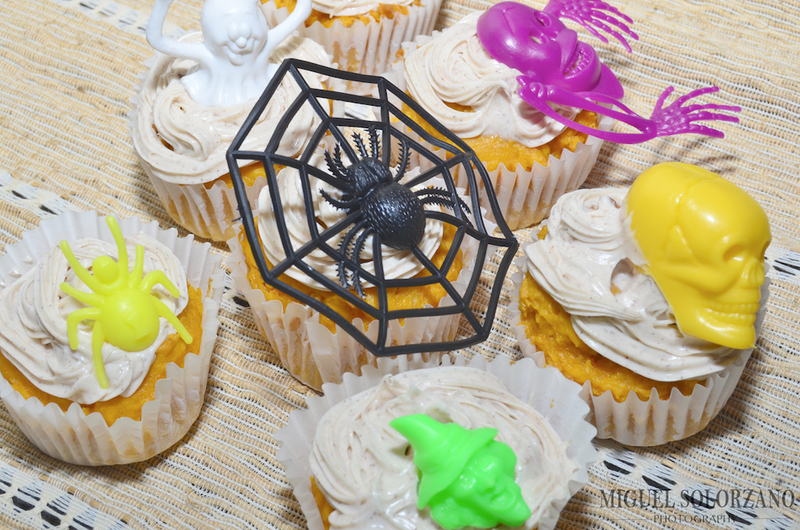 Each with its own specialties and approaches to the cupcake world. After tasting both shops’ cupcakes, it’s a tough choice. I can’t really tell you to pick one over the other, but I can recommend Sweet for its Organic Karat Cupcake and Cakeology for its Red Velvet Cupcake. I wish I had more time to evaluate all of the offerings these shops have. Guess I’ll have to head back to both next time I’m in Boston.